Guided Tour by Dina Bonefacic-Mihaljek, M.Arch. 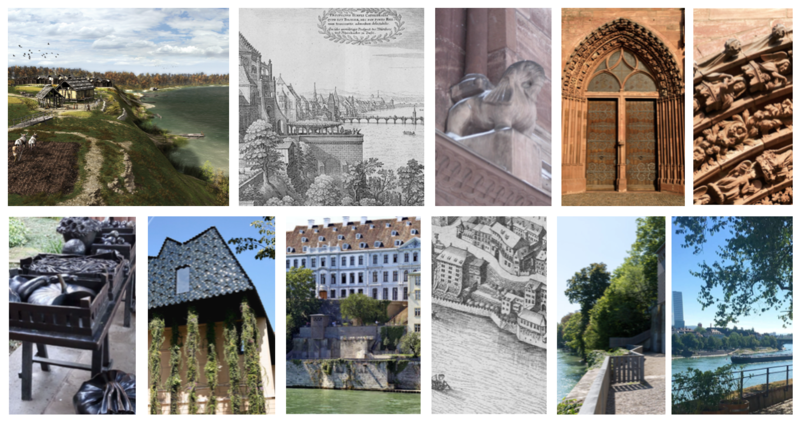 ​The first in the series of walks focusing on the relationship between the natural and the built world takes us to Basel’s historic heart. We will meet on the Pfalz, hight above the Rhein; here we will compare the view of today’s city with images depicting the area at the time it was first settled, thousands of years ago. How did the river get its “knee,” how did it influence the construction of the Mittlere Brücke, or the terracing of the steep slope behind the Münster? Strolling around the Münster, we will look at the way architectural ornament stylises elements from nature. We will discuss the symbolic importance certain plants had in medieval times and will try to use our botanical knowledge to decipher intricate stone carvings of the Münster’s main portal. Fast forwarding to the 20th century, we will address a more sinister aspect of our relationship to nature, as interpreted by Bettina Eichin’s Market Tables in the Münster’s Cloister. On the other side of the Münsterplatz, we will look at Herzog & de Meuron’s Museum der Kulturen, its hanging plants and the way their setup has been received by the public. We will walk further along Augustinergasse, past Melchior Berri’s 19th c. Museum and the Baroque Blaues- and Weisses Haus. Our tour will end with a visit to the recently reconstructed park with roots in the 16th century. Laid out as Basel’s first botanical garden (Hortus medicus), used later as the Sarasin family’s pleasure garden (Lustgarten), half-hidden on the narrow terraces below the Rheinsprung it can now be enjoyed by all.